The Class of 2k12 is a group of YA and MG authors making their debuts in 2012! I was lucky enough to ask most of them two questions about their debut novels. 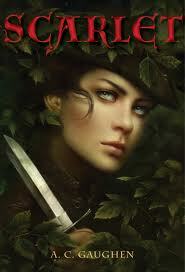 Today I have A.C. Gaughen on the blog to talk about her book, Scarlet! You might remember her from my Looking Ahead interview last year. First, about Scarlet, which is out today! "Posing as one of Robin Hood’s thieves to avoid the wrath of the evil Thief Taker Lord Gisbourne, Scarlet has kept her identity secret from all of Nottinghamshire. Only the Hood and his band know the truth: the agile thief posing as a whip of a boy is actually a fearless young woman with a secret past. Helping the people of Nottingham outwit the corrupt Sheriff of Nottingham could cost Scarlet her life as Gisbourne closes in. It’s only her fierce loyalty to Robin—whose quick smiles and sharp temper have the rare power to unsettle her—that keeps Scarlet going and makes this fight worth dying for." TCR: What was the hardest part about writing your book? What was the easiest? ACG: The hardest part about writing SCARLET was the history. SCARLET is a retelling of the Robin Hood legend, and Scarlet’s story was actually there immediately; her character reimagines Will Scarlet as a girl that is a skilled thief but a total loner, and her whole narrative was just in my mind and it was like word-vomiting until I finished writing it--her voice even includes some deliberate bastardizations of English grammar, and I found myself thinking in that grammar for a while, which was a little disconcerting. I couldn’t help it, and the story practically tore out of me. It was by far the fastest novel I’ve ever written, and there was something insane and wonderfully easy about that kind of all consuming passion. But then I went back over it to reexamine the historical context, and I really stressed about getting it right, especially since from what I can tell, there was no historical Robin Hood. So then it became about treading the fine line between what the popular understanding of Robin Hood’s history is, and where I wanted Scarlet’s story to fit into history. It was definitely complicated, but I loved every minute of it. Thanks so much! Scarlet is out today, so be sure to go pick up a copy of the book! I've been waiting for this one! It sounds fabulous! This book sounds awesome! I almost got a chance to read it - 'cause NG archived it before I could download it - but oh well, I'll just wait till is released. I love the sound of this book and I loved this interview! I really, really want to read this book. It's been on my radar since I first saw it! I mean, it's hard NOT to be excited about a book that retells a classic story... with a twist!